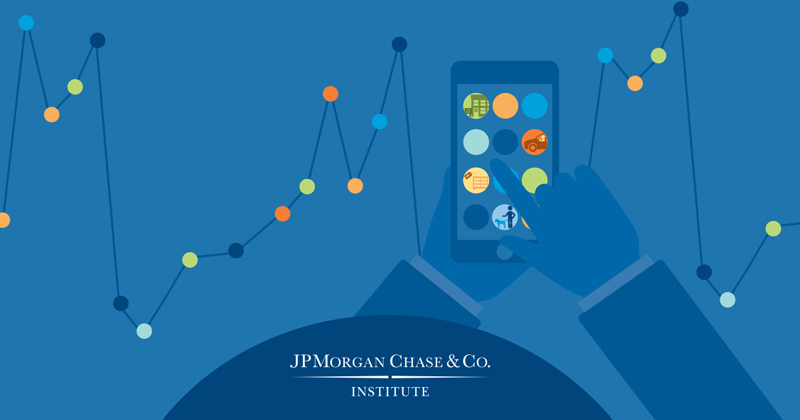 The newest report from the JPMorgan Chase Institute, “Paychecks, Paydays, and the Online Platform Economy: Big Data on Income Volatility,” answers these questions by analyzing an anonymized sample of 1 million Chase customers in an effort to determine the key sources of income volatility and provide the most in-depth look to date into the size and growth of the Online Platform Economy. By examining consumers’ take home pay, the Institute explores their level of income volatility and, for the first time, looks at the growing usage of online platforms, such as Uber, Etsy and Airbnb, as a potential resource to mitigate fluctuations in income. Finding Two: Median-income individuals experienced nearly $500 in labor income fluctuations across months, with spikes in earnings larger but less frequent than dips. Thirty percent of individuals saw monthly changes in labor income greater than 30 percent. For median-income individuals, this volatility translated into an average $475 change, including changes greater than $903 one quarter of the time. Changes in pay frequencies: Eighty percent of individuals experience the “five-Friday effect”. The monthly participation rate increased 10-fold over the three year-period, and the cumulative participation rate increased 47-fold over the three years.In any given month, 0.4 percent of adults (40 percent of all platform participants) received earnings from labor platforms and 0.6 percent of adults (62 percent of all platform participants) received income from capital platforms. Thus, a total of 2.5 million adults are participating in the Online Platform Economy in the U.S. Yet, after the first month of platform participation, participation is quite sporadic.For labor platforms, individuals earned money in only 56 percent of subsequent months; for capital platforms, the number drops to 32 percent. Average monthly earnings were $533 for labor platforms, representing 33 percent of participants’ total monthly income. For capital platforms, average earnings were $314, representing 20 percent of total monthly income. With this report, we can begin to build a deeper understanding of our labor market, how it’s changing and how those changes are affecting individuals’ income. With timely, relevant data, smarter policy decisions can be made that keep pace with changes to our economy and the types of jobs being created. This is the mission of the JPMorgan Chase Institute. We will continue to tap into our unprecedented data set to dig into the turmoil in our labor market and provide decision makers with the facts and analyses to increase economic opportunity by reducing income volatility.